(Phys.org)—NASA and NOAA satellites continue to provide detailed information on Hurricane Isaac as the storm bears down on the U.S. Gulf coast. NASA's TRMM and Terra satellites captured imagery, and NOAA's GOES-13 satellite provided animations of Isaac's march toward the coast today, Aug. 28. Residents along the northern Gulf coast are bracing for the arrival of Isaac, which was recently upgraded to a hurricane by the National Hurricane Center as of 1:00 p.m. CDT. At that time, the center of Isaac was located about 55 miles (~85 km) south-southeast of the Mississippi and was moving northwest at 10 mph and was nearing southeastern coast of Louisiana. After crossing the southwestern tip of Haiti during the early morning hours of the 25th of August, Isaac paralleled the northern coast of Cuba the following day and moved through the Florida Straits with the center passing about 40 miles (~65 km) south of Key West, Florida on the afternoon of the 26th. All the while, Isaac remained a tropical storm despite passing over warm water. As it entered the southeastern Gulf of Mexico on the afternoon of August 26th, Isaac seemed poised to intensify with plenty of over warm Gulf water ahead and relatively low wind shear. However, even as Isaac moved northwest through this favorable environment into the central Gulf of Mexico, it was slow to intensify, becoming a stronger tropical storm but not a hurricane until just before landfall. Several factors seemed to inhibit Isaac's intensification. Being a large storm, Isaac's wind field is spread over a large area, making it less responsive to changes in central pressure. Also, dry air intrusions hindered the development of an inner core. The lack of an inner core was the main reason Isaac failed to really intensify. TRMM captured an image of Isaac on August 28 at 4:01 UTC (12:01 a.m. EDT) as it was approaching the northern Gulf coast. The image was TRMM shows a broad area of moderate (shown in green) to heavy rain (shown in red) wrapping around the southwestern side of the storm with only moderate to light rain (shown in blue) on the opposite side and no heavy rain near the center. The cloud shield (shown in white) is also well pronounced in the southwestern half of Isaac but inhibited along the northern edge. At the time of this image Isaac was a strong tropical storm with sustained winds of 60 knots (~70 mph). Because of its large size, Isaac stills poses a threat for storm surge and it's expected slower movement over Louisiana brings the risk of flooding. 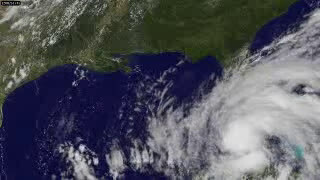 An animation of NOAA's GOES-13 satellite imagery from Aug. 26-28, 2012 of Hurricane Isaac's track through the Gulf of Mexico was animated by NASA's GOES Project at the NASA Goddard Space Flight Center in Greenbelt, Md. 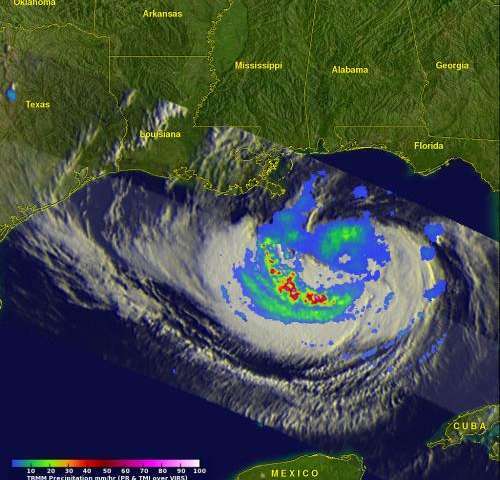 The animation shows Isaac is headed for New Orleans, exactly 7 years after hurricane Katrina. The Moderate Resolution Imaging Spectroradiometer (MODIS) instrument on NASA's Terra satellite captured a visible image of Hurricane Isaac as it approached Louisiana on Aug. 28 at 12:30 p.m. EDT. 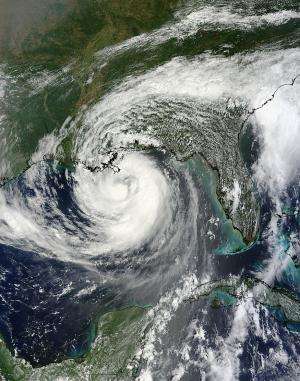 A large band of showers and thunderstorms stretched from the Carolinas, west over Georgia, Alabama, Mississippi, Florida and into Louisiana, wrapping into Isaac's center of circulation when it was centered about 100 miles south of the mouth of the Mississippi River. On Aug. 28 at 2 p.m. EDT, Hurricane Isaac's maximum sustained winds were near 75 mph (120 kmh). Isaac is a category one hurricane on the Saffir-Simpson scale. It was centered about 55 miles (85 km) south-southeast of the mouth of the Mississippi River near latitude 28.4 north and longitude 88.7 west. Isaac is moving toward the northwest near 10 mph (17 kmh). The National Hurricane Center expects Hurricane Isaac should reach the coastline of southeastern Louisiana as early as this evening. At 2 p.m. EDT, the National Hurricane Center noted that tropical-storm-force winds were occurring at the mouth of the Mississippi river. That's where a NOAA observing site located at Southwest Pass, Louisiana reported sustained winds of 60 mph (93 kmh) and a gust to 76 mph (122 kmh) at an elevation of 80 feet.